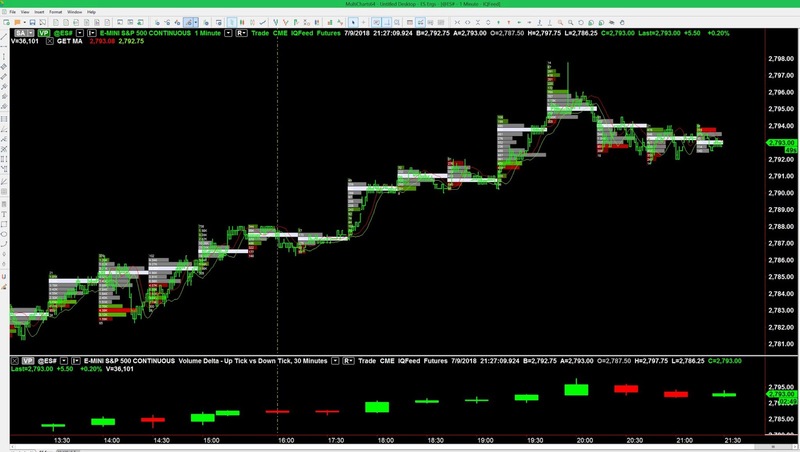 There are lots of opportunities in the emini ES futures outside of the regular trading hours of the stock market, especially after the RTH close. There are many, many traders and institutions who have to re balance positions after each settlement period. Also, Asian markets are opening for a new day when U.S. markets have just closed. Its at these times that markets find themselves out of balance on the majority of days. Additionally, I think its easy to find a bias at this time so understanding the order flow is very easy. The pic below shows the settlement close on the left and the reopen into the "new" day. I use the series of volume profiles to track what is happening in the order flow and the bars for execution. You can see the moving averages that can be used to trigger a trade if you need some extra training wheels or a specific reason to trigger the trade. This I guess is more psychological than tradecraft but if it helps ............................. It is quite simple but not simplistic as there are quite a few nuances to be learned to trade like this.